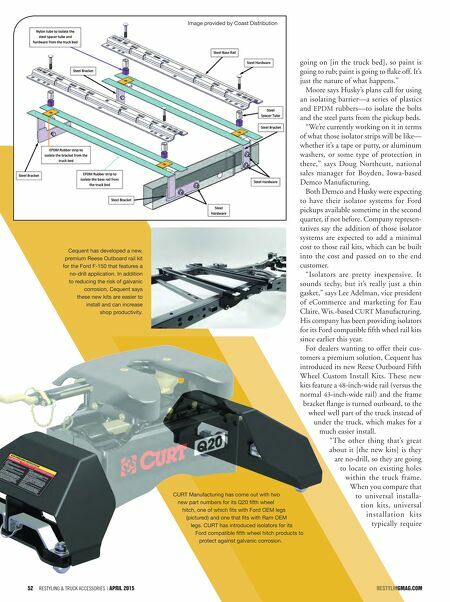 restylingmag.com April 2015 | Restyling & tRuck AccessoRies 53 you to drill eight holes on the truck frame, which is obviously more work," Romero says, that adding this product will increase shop productivity while offering a better install. 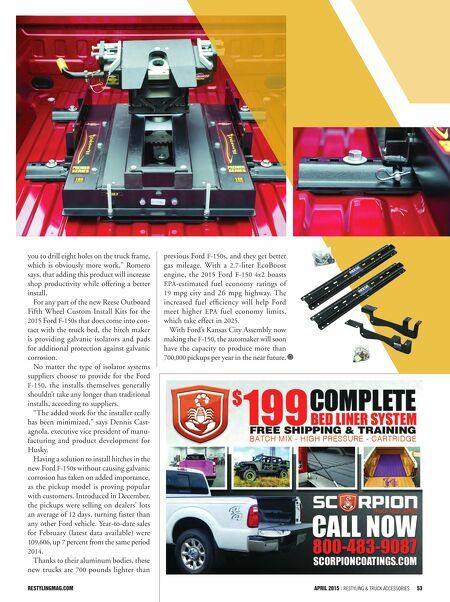 For any part of the new Reese Outboard Fifth Wheel Custom Install Kits for the 2015 Ford F-150s that does come into con- tact with the truck bed, the hitch maker is providing galvanic isolators and pads for additional protection against galvanic corrosion. No matter the type of isolator systems suppliers choose to provide for the Ford F-150, the installs themselves generally shouldn't take any longer than traditional installs, according to suppliers. "The added work for the installer really has been minimized," says Dennis Cast- agnola, executive vice president of manu- facturing and product development for Husky. Having a solution to install hitches in the new Ford F-150s without causing galvanic corrosion has taken on added importance, as the pickup model is proving popular with customers. Introduced in December, the pickups were selling on dealers' lots an average of 12 days, turning faster than any other Ford vehicle. Year-to-date sales for February (latest data available) were 109,606, up 7 percent from the same period 2014. Thanks to their aluminum bodies, these new trucks are 700 pounds lighter than previous Ford F-150s, and they get better gas mileage. With a 2.7-liter EcoBoost engine, the 2015 Ford F-150 4x2 boasts EPA-estimated fuel economy ratings of 19 mpg city and 26 mpg highway. The increased fuel efficiency will help Ford meet higher EPA fuel economy limits, which take effect in 2025. With Ford's Kansas City Assembly now making the F-150, the automaker will soon have the capacity to produce more than 700,000 pickups per year in the near future.